Note: Family Graves for Lewis H and Libbie (Mathise) Van Vaklenburgh on back on stone. Ella's Parents. Tells of Granddaughter Ella (Van Valkenburgh) Goodhines traveling to Deck after her death. Ancestry.com. 1900 U.S. Federal Census [database on-line]. Provo, UT: MyFamily.com, Inc., 2004. Original data: United States. 1900 United States Federal Census. T623, 1854 rolls. National Archives and Records Administration, Washington D.C. Herkimer, New York, ED 38, roll T623 1039, page 9B. 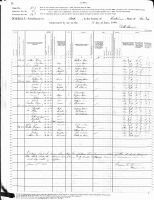 [S00131] 1880 United States Federal Census, Ancestry.com and The Church of Jesus Christ of Latter-day Saints, (Ancestry.com Operations Inc, 2010), [database online]. 1880 U.S. Census Index provided by The Church of Jesus Christ of Latter-day Saints © Copyright 1999 Intellectual Reserve, Inc. All rights reserved. All use is subject to the limited use license and other terms and conditions applicable to this site. Stark, Herkimer, New York, ED 39, roll T9_838, page 416.2000, image 0215. [S00055] New York State Microfiche Birth, Death, & Marriage Archive, New York State Archive. Copied and Transcribed by Michael Schuler, (Microfiche Birth, Death, Marriage Archive), Microfiche Index. Ancestry.com. 1910 United States Federal Census [database on-line]. Provo, UT: MyFamily.com, Inc., 2004. Indexed by ProQuest from microfilmed schedules of the 1910 U.S. Federal Decennial Census. Data imaged from National Archives and Records Administration. 1910 Federal Population Census. T624, 1,784 rolls. Washington, D.C.: National Archives and Records Administration. Herkimer, Herkimer, New York, ED 13, roll 952, part 1, page 3A. [S00131] 1880 United States Federal Census, Ancestry.com and The Church of Jesus Christ of Latter-day Saints, (Ancestry.com Operations Inc, 2010), [database online]., Stark, Herkimer, New York (Page 30 of 30). [S00012] 1910 United States Federal Census, Ancestry.com, (Ancestry.com Operations Inc, 2006. ), [database online]., Warren, New York; Series: T624; Rol: l952; Page: 58A; Enumeration District: 38; Part 2; Line 2. [S00034] FamilySearch.org, Batch 8827002 Sheet 25 Source Call No. 1553283 Type: Film. [S00104] Warren Historical Society Files, Warren, Herkimer, New York, USA, (Warren Historical Society), Family File., Van Valkenburgh & Goodhines Wedding Invitation - "V" Family File.